← Academy Q&A – What Rod? It’s a strange old world we live in – for the best part of six months we had frozen lakes, snow and frost with everyone moaning it was too cold. Now look what happens – we get summer and it’s too hot! Well let’s be honest about it – they’re not ideal catching conditions but we shouldn’t be complaining. So far this year I have struggled to really get my teeth into anything, in particular angling wise. I had an amazing trip over to Lac De Premiere at the start of spring. After a slow start, a move of swims really paid off and I ended up catching consistently for the remainder of the trip – no real leviathans but great fun and some awesome fish. After this trip however, I haven’t really settled on anywhere since. I did have a quick night on my syndicate water the day after getting back from France which suddenly turned into a three nighter with a couple of fish to show for my efforts. After this it was back to the realities of work. I have always fished on limited time, usually just one night at a time turning up after work and this was the real stumbling point for me this year. My syndicate water in Northampton is a 150 mile round trip so not only is the travelling time a bit of a downer but there is also the financial aspect of it all. Really I have just been struggling to get motivated and, other than a single night a week or two ago where I managed a dark old mirror off the surface, I haven’t really been down there. 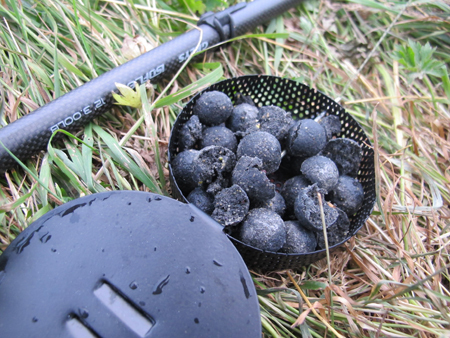 I have noticed though that going less regularly definitely makes you work harder throughout the session – I hadn’t noticed at the time but last season, fishing as much as I did at times makes it really easy to fall into the routine of doing the same thing week in week out, almost brain dead Carping. It was time to come up with a backup plan in the mean time as I’m sure I will be back down in Northampton come the autumn. I had a couple of ideas in mind. There were a couple of waters with limited access which would most definitely be nights only, but I think that’s a project for another time and I felt myself being drawn to the rivers. After a bit of digging I found out about an area that had produced a number of Carp a few years ago. In preparation for the magical 16th I began to get some bait going into the swim in question – a large slack on a bend and a fallen tree provided cover and it felt right. I put a good 30kg of bait in over the week preceding the 16th, a mixture of vitalin, parti blend and some of Aqua Dynamix Edge Black boilies. The gear was sorted and ready to go – I turned up late on the 15th to give it one final bait up and disaster – three bivvies’ were set up along the far bank. I was gutted – all that effort had gone to waste and I was kicking myself for not having a backup area and didn’t end up fishing. I later found out that one of the guys had a couple of Carp topped off by a mid-20 common; at least I had the location right! After a couple more checks on the area it seemed that it was very popular this season – possibly word had got round of the recent captures but I decided to give it a wide berth for a while and planned on making a return later in the season. In the meantime though it was time to chuck on my walking boots and try and find a new area. A mile or two upstream I eventually found what I was after – a big weed bed and out the corner of my eye I spotted a large fish disappearing beneath the raft. I couldn’t be sure if it was a Carp or a Barbel but it was a good sign. Shortly after I had another sighting which was definitely a Carp – only a small common but enough to give the area a go. I used the same procedure – bait for a few days and then fish it although this time there wasn’t an angler in sight – in fact I didn’t see another person for the duration of my session. 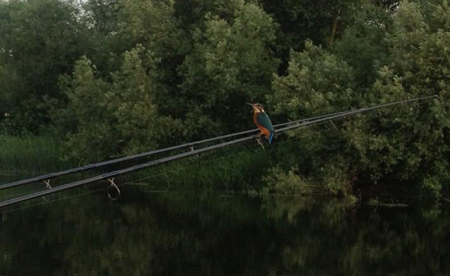 Once I had got the rods out and settled down for the night a Kingfisher landed on my right hand rod – frustratingly my camera wasn’t to hand, although I managed a quick snap on my mobile. To me this summed up what I wanted from river fishing. That night brought with it my first bite as well; unfortunately it didn’t turn out to be a Carp but a nice Barbel just under double figures. A strange dropped take left me wondering what could have been but I had thoroughly enjoyed the first proper session, I’m back down for another session as soon as I finish this article so I think it’s a fitting point to end it there and I’m off to try and catch a Carp! 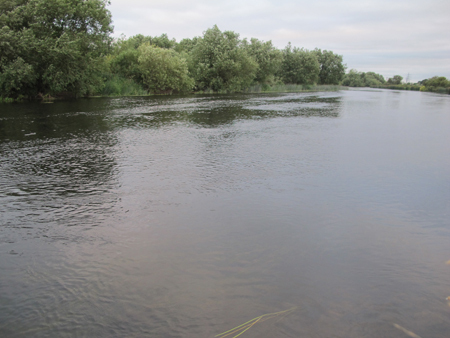 I couldn’t end it there, having just returned from my night I think it’s fair to say that the peg kicked off big time – the temperature had dropped into the high teens and the pressure was dropping as well so ideal conditions. 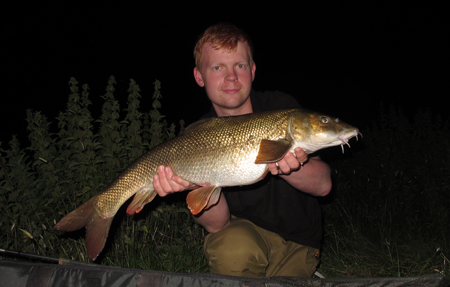 It started off with a Chub of around 4lbs, and then throughout the night I had 6 or 7 Barbel averaging 8lb or so with two 10lbers as well. To try and get some sleep and hopefully leave a bait out long enough for a Carp, I changed over to a greedy pig style rig – two 15mm bottom baits and half a pop up. At first light this rod took off and after a ferocious battle I landed my first river Carp of the season. A stunning chunky linear to round off what I have termed the river grand slam! 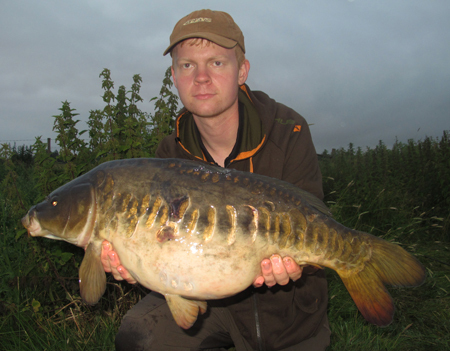 This entry was posted in Profiles and Angling Stories and tagged carp academy, Rich Chapman. Bookmark the permalink.